True Core Stability: A Summary of Why the Diaphragm is so Important. The diaphragm is invisible to us, and yet we feel its effects more than any other muscle/organ as it influences breathing efficiency, cardio-vascular efficiency, postural stability and organ health. It is the dividing structure of the trunk and its capacity to change its shape is the role that we need to understand, in order to understand true core stability. Stabilisation and Respiration are one unit, they can’t be separated. Therefore the Diaphragm has a two-fold function; respiration and stability. 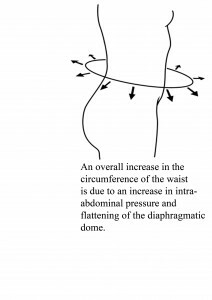 The Diaphragm’s contributes to spinal stability by increasing intra-abdominal and intra-thoracic pressure acting as an antagonist against external forces. Insufficient activation of Deep System Stabilisation is a key factor in pathology and dysfunction. The Diaphragm contributes to spinal stability by flattening during which trans-diaphragmatic pressure increases. During Diaphragm contraction the spine and torso are stabilised to enable proper activation of muscles inserting on the extremities. This is how ideal recruitment is influenced. The para-spinal muscles are a mirror to function in that para-spinals must compensate for insufficiency. If the diaphragm is oblique in its orientation, there will be a concomitant hypertrophy of the para-spinals. 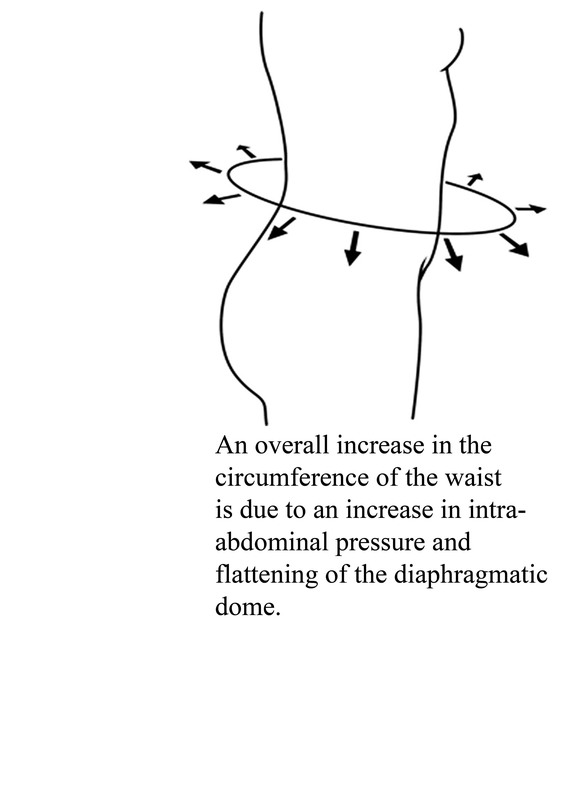 The flattening of the diaphragm is not dependent on breathing while increasing intra-abdominal pressure (IAP), in that this can be achieved isometrically. This ability is the control of the non-respiration activity of the diaphragm. However in order to optimise deep system stability it is important to learn to maintain IAP, while exhaling. This ability reflects control of the deepest aspects of functioning in that you are training eccentric control of the diaphragm itself. In terms of diaphragmatic activity, different parts can be activated to different degrees in interplay with abdominal musculature. The most important aspect of activation is the lateral-dorsal aspect of the diaphragm. The diaphragm needs to be horizontal in its orientation, in order for this posterior aspect to exert its influence on low back stability. The greater the difference between expiratory and inspiratory diaphragmatic positions on MRI images (Miyamoto et al 2002), the greater the respiratory volume. Therefore there is a significant correlation between respiratory volume and diaphragmatic range of motion (ROM) during tidal respiration. Individuals with limited capacity to contract the diaphragm for stability, may have a higher likelihood of back pain. If the chest goes up on an in-breath, the intercostal spaces do not widen. The systemic understanding of breathing-stability has to be one of the most important lessons we need to learn in order to have a long, healthy and fulfilling life. Compensations in this area can be overcome by understanding daily exercises for breathing-stability.